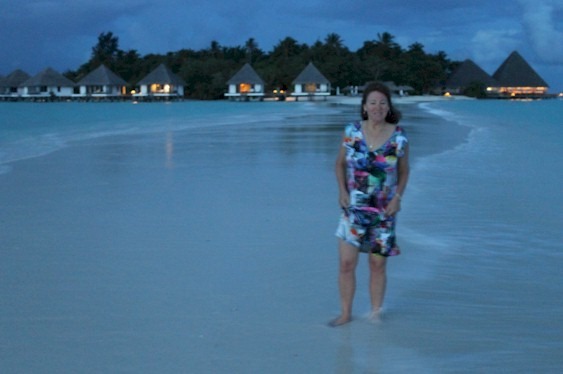 The sense of being in the Maldives in the middle of the Indian Ocean is outstanding. And a Gangehi you can literally (or should I say “littorally”) be out standing in the middle of the ocean. 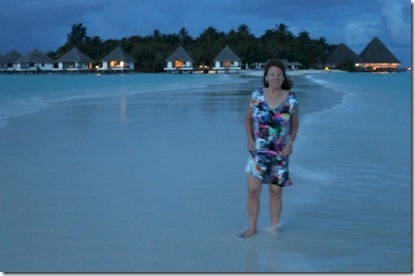 One of the absolute distinctions of the Maldives destination are its pervasive shallow lagoons. Lots of places in the world have atolls and coral reefs, but the Maldives has an elevation that just hits sea level. A few inches above sea level and a few inches below. This topology means you can snorkel in waist deep water a kilometre off shore, and walk or wade to the neighbouring island. Or you can, on some resorts, just amble out into the middle of nowhere. One of our favourites is Kuramathi’s which points nearly due west making it an ideal sunset “point”. Other prominent powdery promontories are at Ranveli, Cocoa Island, Palm Beach and Kuredu (thanks Adrian), but the longest is Gangehi’s which juts out a full 800m from shore. The picture above provides some perspective and we weren’t even all the way to the end because the tide wasn’t fully out. It is a truly romantic sensation to be standing in the middle of the ocean in the middle of nowhere just you and your loved one. Meat and potatoes. The most basic and humble of dishes. 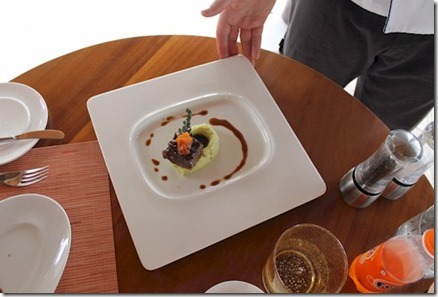 But in the Maldives, even the simplest things can get the luxury treatment. 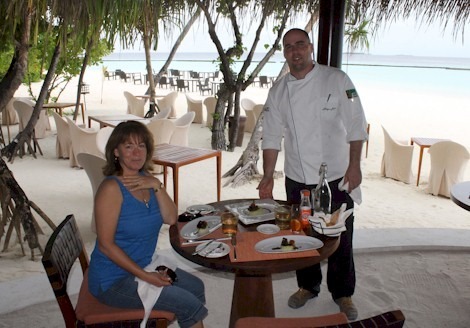 The beef is not typically at the top of the menu at the Maldive resorts. Yes, they import it (usually from Australia) to cater to its popularity, but most of the culinary attention is directed to the location driven seafood fare. And as a red-blooded American, I have had my share of exceptional beef often at the steak houses that dominate the USA restaurant landscape. Eateries like Daniels Broiler in Seattle, Masterpiece in Kansas City, and Mortons about everywhere. But I have never experienced beef like I have at Constance Halaveli. 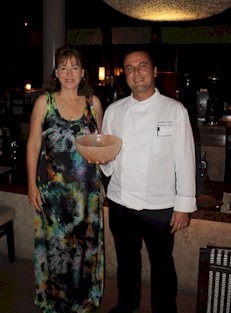 The head chef there Holger Joost (see photo above) treated us to a taste of one of his signature dishes – Tazmanian Wagyu Beef Cheeks, slow cooked for 48 hours with local mangos and chillies served with wasabi potatoes. I had had “cod cheeks”, but never “beef cheeks”. Holger informs us they are one of the finest cuts of this very special breed which is a cross between the Kobe variety and Black Angus. Pure Kobe can be as much as 50% fat which can be a bit much for some palates. The Tazmanian Wagyu is a finer balance between flavour imparting fat and the tender meat itself. Are we picked up our knife and prepared to dig in, Holger stopped us and said “no need for a knife…use your spoon.” He claimed the meat was as soft as butter, but he was wrong. It was softer. A bite literally did melt on your tongue with subtle flavours filling your mouth. Not to mention that the next time we serve even our humble UK beef we are going to try a recipe for “wasabi potatoes” which were an inspired complement to the beef. Colourful creatures floating all around you. 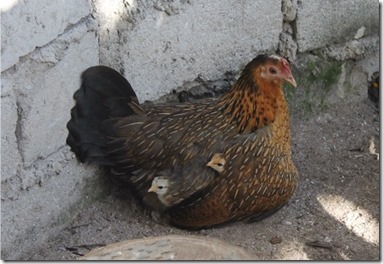 Some inquisitive about your presence, while others more skittish and shy. Large and small, or all shapes and colours. 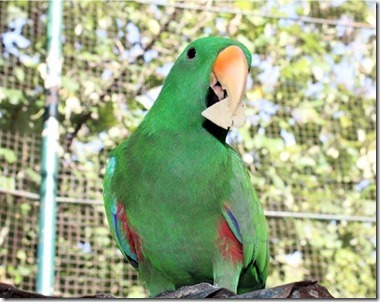 Not the marine life in the water, but the bird life in the air on Chaaya Reef Ellaidhoo. 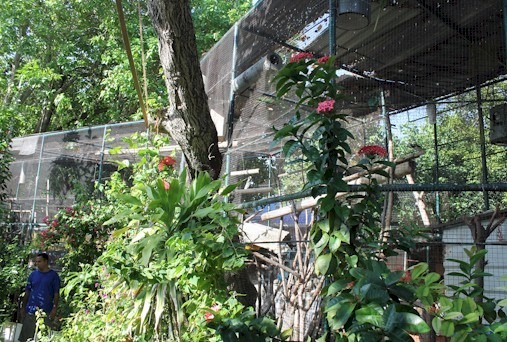 Elaidhoo features an expansive aviary filled with fowl of all description – parrots, exotic hens, cockatoos [OTHERS]. As colourful as any collection of tropical fish you will find in the water. 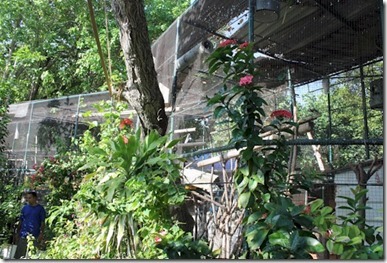 We took as many pictures visiting the aviary as we did on any house reef. 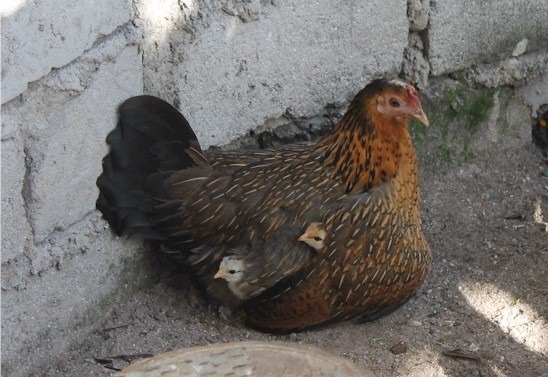 But my wife Lori’s favourite (so much so that she changed her Facebook profile picture to it) was of the baby chicks who hid in their mother’s wings and poked their heads out (see bottom). 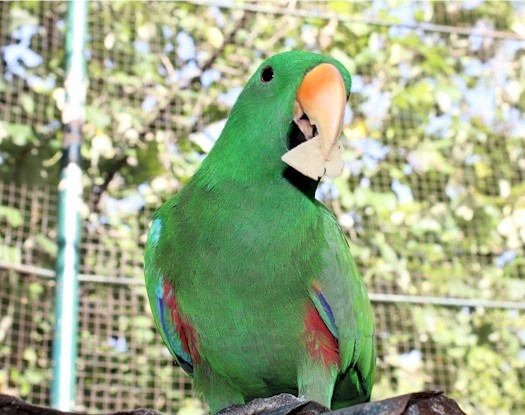 For a destination renowned for romance and honeymoons, I remain a bit surprised at how few heart-shaped features you find in the Maldives. True, the Maldives is has a classy and posh vibe these days, but still some of the schmaltz is can be a bit of cheeky fun. 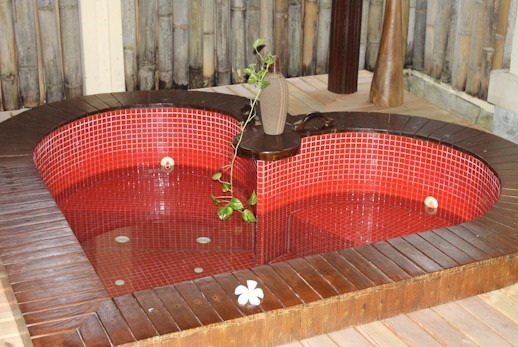 At least Bandos is getting into the romantic spirit with its Orchid Spa VIP treatment room that offers a heart-shaped Jacuzzi. I’ve done lots of country ambiences, but this is the first “city” ambience. I chose it for today, a bit out of order from the tour itinerary, because of its connection to my wife’s and my anniversary celebrated today. 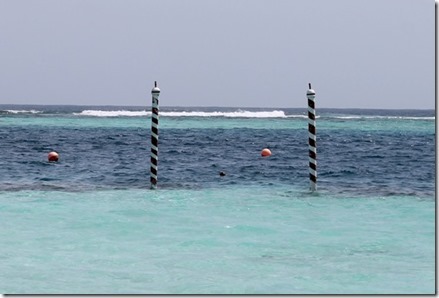 I wouldn’t be the first to dub the Maldives the “Venice of the Tropics”. Something about being by the water evokes romance and relaxation. And being surrounded by it in every nook and cranny all the more so. But Nika takes its connection to “Venezia” much more than metaphorically. The owner is actually from Venice himself and still lives there part of the year. The reception (photo above) resembles some antiquated arched grotto, the rooms are decorated with gondola models, pictures and other paraphernalia from Veneto. 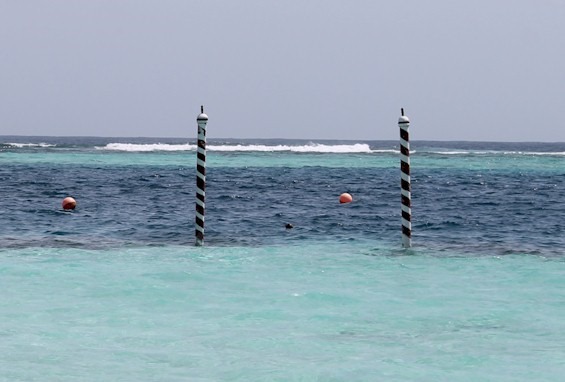 The channel markers in the lagoon are even authentic “palinas” (the candy-striped mooring poles)! In recent years, we have been visiting the Maldives mostly in July and very often are there for our anniversary (just missed this year though). When we we much younger, we gave ourselves an anniversary gift to Venice, but both our lives got so packed with professional commitments that we kept postponing it until it fell off the calendar. To make up for the five year wait, on our 15th anniversary, I re-gave the same gift…but I added a trip on the Orient Express (a nod to our honeymoon train ride to Montreal from North Carolina) and a stay at the iconic Hotel Cipriani. It was like our planned 10th…with interest. It was one of the most memorable and romantic trips in our 28 years together. A symbol of how things just get better with time. Venice and the Maldives…two of the world’s most iconic destinations for romance. And in Nika you find them both! We take a break for the Tour #4 Best of the Maldives to recognize Maldives National Day. With an infographic that captures so much of the Maldives nation at a glance. 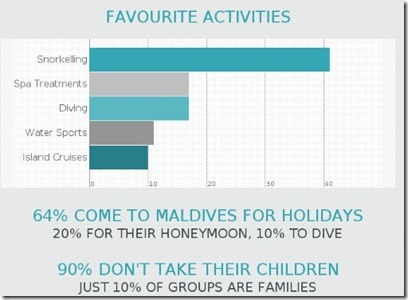 A few highlight snippets of a graphical Harper’s Index of Maldives fun facts. As a champion for Maldives snorkelling, I was inspired to see how prominently it stood out in the activity survey (see above). 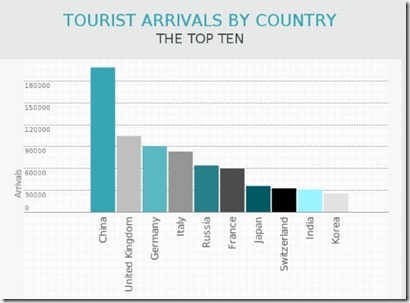 And, the rise of Asian visitors is prominent in the graph of arrival stats below as half of the top visitor locations (and more than half of the total guests) hail from Asia (not Europe as was the case in previous years). Maldives resorts are full of surprises. Like getting a taste of the highest place on the planet served to you at the world’s flattest place. 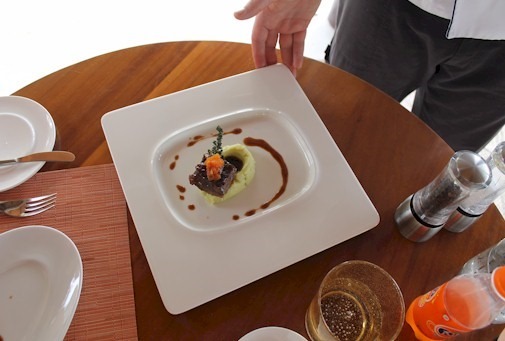 One & Only Reethi Rah offers up an epicurean feast of food and drink superlatives which will fill the “Best of the Maldives” plate for months to come. 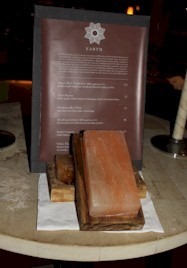 One that captured our imagination was their salt stone cooking. They heat up a block of salt stone from the Himalayas to 400 degrees on which you cook your food at your table. The salt in the stone gently leeches into the food in the process for a very subtle seasoning. 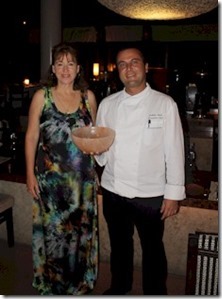 They also have bowls made out of the salt stone (see below) for serving other dishes. This particular salt crystal from this area of the world is pink. I had never realised that salt came in so many colours. I had visited the famous Wieliczka salt mines in Krakow and their salt crystal was blue. 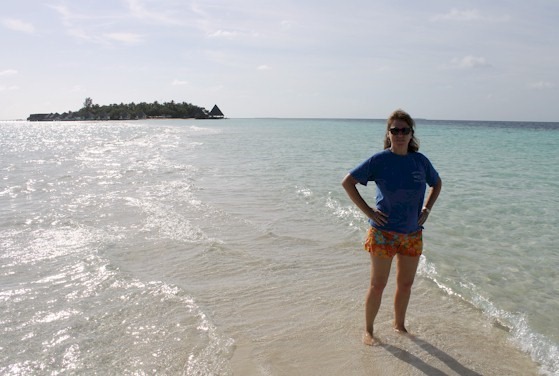 I’ve gotten ahead of myself a bit with the posts on Ellaidhoo’s and Kurumba’s snorkel aids in my post-tour posts (given their tie into the “not seen” series), but now time to share a few of the gems from the tour. 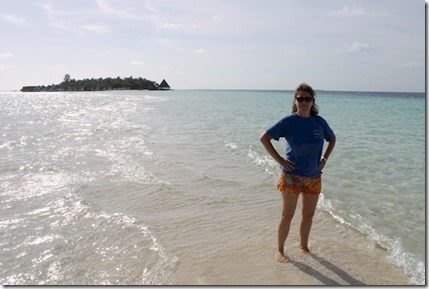 Over the next fortnight, I will share a “Best of the Maldives” post gleaned from “Tour 4” in order of the resorts toured. They aren’t necessarily the biggest or “best” of the “best ofs”. Just some that particularly captured my appreciation and fancy. 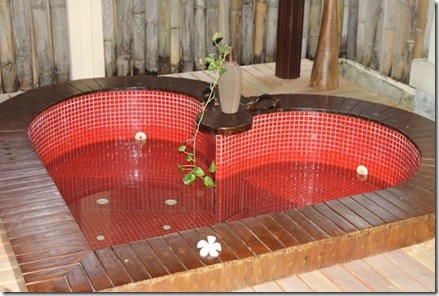 Not only was our first resort of the tour Jumeirah Vittaveli, but our very first activity was a massage at their spa. A thoughtful remedy to 10 hours in economy class. 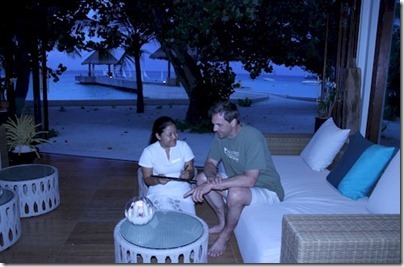 I’ve enjoyed hundreds of spa treatments in both the Maldives and the around the world. One of my pet peeves is when the therapist asks you if you want them to focus on any particular are..and then doesn’t focus there. I often am fine on my back (which is the masseuse’s favourite body part) and prefer more time spent on limbs (legs, arms, feet) or upper body (chest, shoulders, neck). Too many times when I provide this guidance, the person seems to disregard it completely and carry on in autopilot with some preprogramed routine. The first sign that Vittaveli’s Talise spa offered something different was the lack of a treatment menu. They sat you down and had you fill out a questionnaire. This step is not so different from standard operating procedure in many spa, but the primary focus is just usually about getting you to sign a disclaimer and declare any medical issues. But Vittaveli’s approach was quite different. First, the questionnaire went into a bit more depth than usual. And rather than the cursory glance by the therapist, so did the review of the form. And actually, it was more of an interview than a review. The spa manager, Sova, sat down with Lori and I and crafted a unique treatment concoction based on my preferences. For me it was an oriental massage combined with Thai stretch elements for the limbs. For Lori it was a Balinese massage for lower body and Swedish for upper. My wife who is a therapist (speech and language) herself remarked that their approach was a classic example of a “Person Centric Care Plan”. This technique is a big thing in health care these days according to Lori and is the basis for all of her work at the UK Epilepsy Society. But the proof of the massage is in the rubbing. Would the therapists execute the plan or was it all just a preamble of palaver? 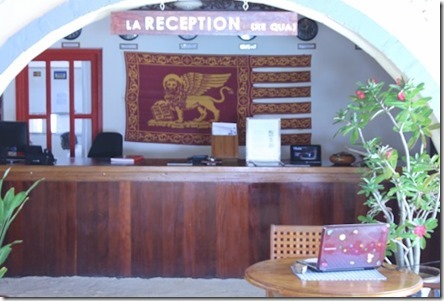 Our two therapists, Kanlayanee and Taksana, did exactly the detailed requirements both my wife and I specified. Taksana working on me hardly touched by back (as requested) and spent lots of time of my shoulders which were tight from the plane journey. Kanlayane spent more time on Lori’s chronically troublesome neck than she has ever had with hugely therapeutic results. For all of the fads and trends that hit spas these days, it was inspiring to see Vittaveli embracing the latest thinking from the health care field rather than the cosmetic or pop-spirituality fields. One of the things I have “now seen” is a li-lo for snorkelling. I called this out last year and now Chaaya Reef Ellaidhoo finally has one. It is called a “Microsub” and you can rent it for $20 per hour from the dive centre. 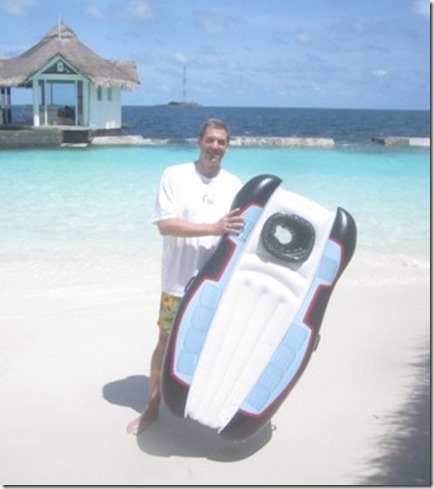 It is a great device for weak swimmers who want to enjoy the spectacle of snorkelling in the Maldives. 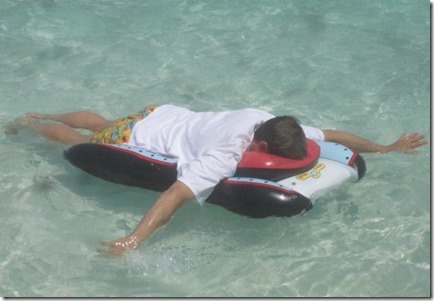 In some respects, it is better than a life jacket because it keeps the legs elevated at the top of the water. One of the problems with weaker swimmers using life jackets for snorkelling is that they let their legs dangle underwater and often kick coral inadvertently. Just another way that the Maldives makes the undersea extravaganza accessible to just about everyone. 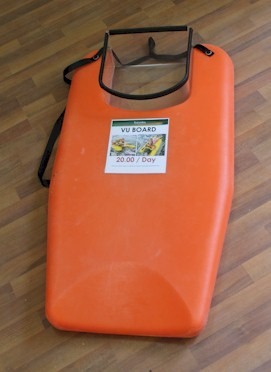 If you are looking for a snorkel floatation aid that is a bit sportier, consider Kurumba’s “Vu Board”. Available from their sports centre for $20/day. Kurumba is quickly becoming one of my favourite house reefs to snorkel (I’m more of a fish guy than a coral guy and Kurumba’s is more of a fish reef than a coral one), and Vu Board brings it to life to even more people.